Our designer security systems protect your goods, while you get on with the job. The Problem: Opportunist thieves can steal your cargo whilst you’re making a delivery if your driver doesn’t lock up every time. You need to be sure that your van is secured, automatically, without any special actions needed by the driver. The Solution: The Wolf Slam-Lock is a fully automatic system that can be added to factory-fitted, remote-control locking or to vans with no central locking at all. Simply closing all the cargo doors automatically locks them! Unlock with the remote control or with the van’s keys. 5-second delay after door closure before the doors are locked. Doors automatically re-lock after 30 seconds if not opened. WSL-1 Kit. For Vans with Factory Remote Control Locking. Electronic module and relays to convert most factory-fitted remote locking to automatic slam locking of the rear cargo area. WSL-2 Kit. For Vans without Central Locking. 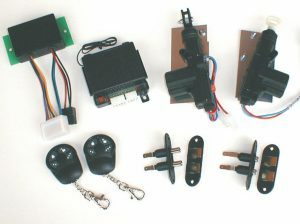 A complete designer kit including two electronic door lock motors for the cargo area, remote control receiver with two transmitters for unlocking and the electronic module and relays to automatically lock the doors when both are closed. The kit shown converts the cargo area to a Slam Lock with Remote Control Unlocking.